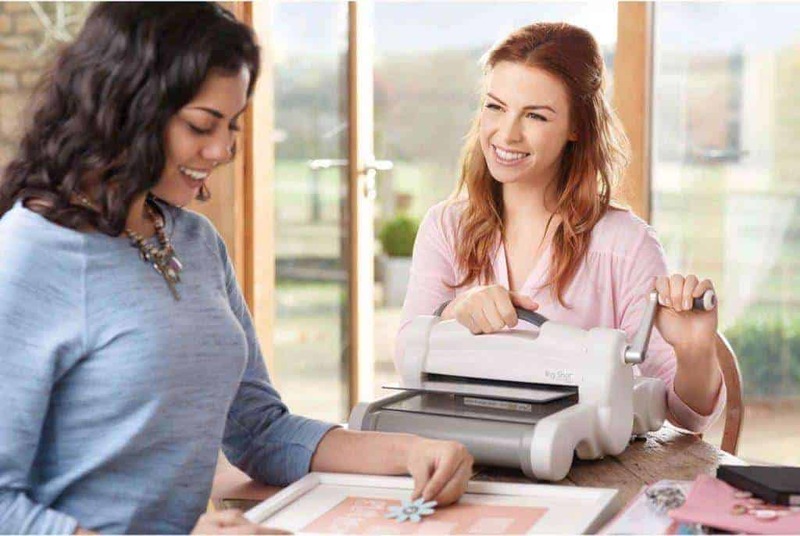 In most ways the Sizzix Big Shot Plus is really the same machine as the Sizzix Big Shot; the only difference is that it has a larger cutting surface (can cut up to 8.5 x 11″). And as a paper crafter enthusiast, I’m sure that you know how loved the Sizzix brand is in the crafting community. Their combo die cutting & embossing machines can add the perfect final touches to custom made embellishments, shapes and die cuts. It has the ability to cut and emboss all sorts of materials from paper, vellum, fabric, chipboard, and cork. Whilst the machine is heavier than the Big Shot, it is still lightweight and portable. Only negative? It features a crank handle – bring on the muscles! Now that we know that the Big Shot Plus Die Cutting & Embossing machine is indeed a fabulous machine, what we really need to do is to figure out if this is the right machine for YOU. And to help you out, we have come up with a Sizzix Big Shot Plus review. 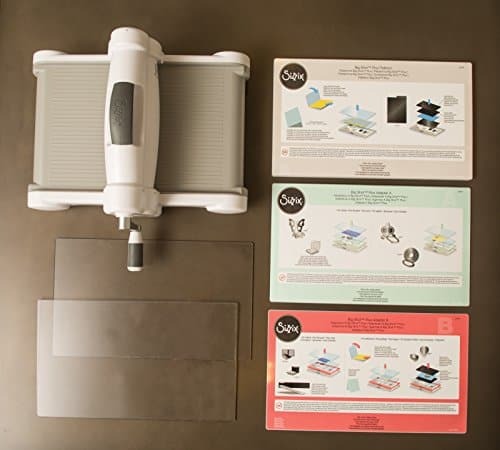 Find below our review rating of this popular die cutting and embossing machine by Sizzix. This Big Shot Plus is perfect for scrapbookers, cardmakers, and quilters who are getting started with die cutting machines. It has a larger cutting surface than the cheaper Big Shot, which is brilliant for those wishing to create larger die cuts or embellishments. It is easy to use. It is one of the best crank operated die cutting and embossing machines on the market currently. It is a die cut and embossing machine in one. Very powerful crank feature that can cut through multiple layers of material. Super modern and sleek look. Affordable. Offers a slightly larger cutting space in comparison to the Big Shot. The Big Shot Plus Cutting Machine is not only our personal favorite but also an affordable and easy-to-use machine. We recommend that you compare the Big Shot Plus against electric die cutting and embossing machines. 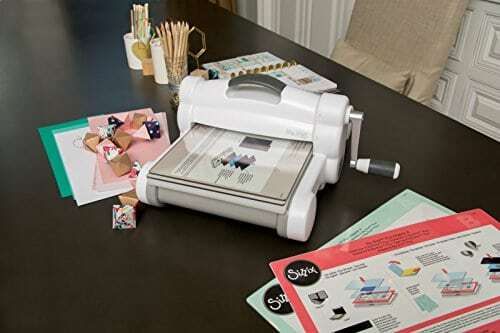 The Sizzix Big Shot Plus Die Cutting Machine comes with all the platforms and plates. The machine measures approximately 15 3/4″ x 11 3/4″ x 7 1/2″. You will, however, need to purchase some dies and embossing folders before you will be able to use the machine. You can browse through some of our favorite dies and folders here. The cutter has a larger cutting surface in comparison to its ‘little brother’ the Sizzix Big Shot. The Big Shot plus has a cutting of 8.5 x 11″. What Material Can it Cut? Some dies can handle cutting some material better than others, so it is best to check out the Sizzix Die Cheat Sheet. 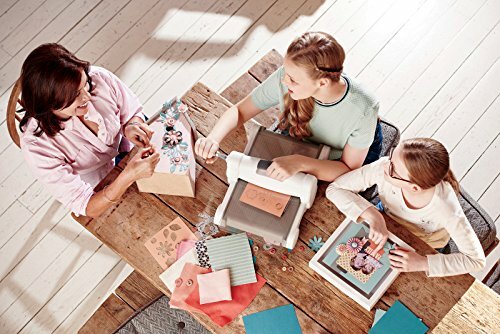 The machine works brilliantly with any Sizzix® die or embossing folder, including their smallest dies to their big 9″ wide steel-rule dies and embossing tools. Important to note that the machine is not compatible with the Bigz™ Pro dies. Whilst it is larger than the Big Shot, it is still portable enough to take with you to crafty gatherings. The motor is strong enough to cut through multiple layers of material. This machine is perfect for those who are after a great die cut and embossing vinyl machine! The Big Shot Plus offers a wider cutting width than its little brother the Big Shot. It is a brilliant machine for those who love to enjoy their craft with groups and friends, due to its lightweight and portable features. You might even wish to purchase the whole Sizzix Big Shot Plus Starter Kit! 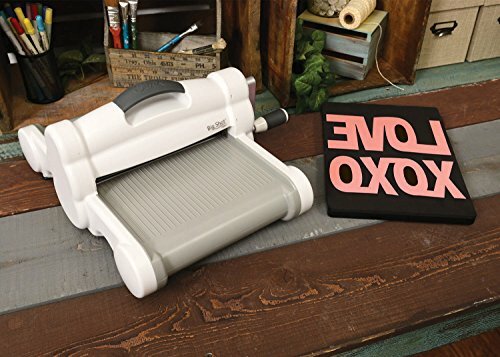 I guess your main problems will be which dies and embossing folders to purchase with these scrapbook cutting machines!